I have been waiting for this book for sometime, it's birth has been somewhat drawn out! But it was worth the wait. It is a medium format hardback book of 515 pages of full colour pleasure. 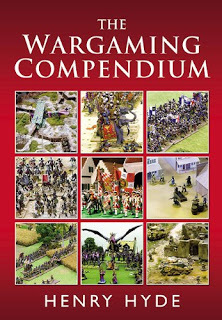 Everything is here including interesting sections on the history of wargaming, how figures are made and advice for blogging. There is a ruleset, painting guidelines, discussion of gaming eras as well as miniature scales. For the beginning wargamer it is a must, for the seasoned wargamer it is a pleasure. Available at Amazon UK, read the 17 reviews. This has been probably one of the most anticipated rulesets for some time. There have been over 100 posts per day on the TFL Yahoo site, and well over 1000 preorders before the release date of August 21. I have purchased 5 TFL rulesets, and one can really see the improvement in each publication. Again full colour, this time large format softcover, with 105 pages. Beautifully laid out with multiple excellent diagrammes. I have had some issue with the TFL writing style in the past but the writing in this book just flows and is remarkable for it's clarity. I really can not wait to play this ruleset. I have made some contact with other Massachusetts wargamers who are interested in these rules, so hopefully soon. An excellent review can be found on the blog Anatoli's Game Room. Available at TooFatLardies. I have to admit that I really not have had a chance to have a good look through this book yet, mostly because I am trying to control myself from going off on another tangent.......not yet anyway. I will discuss my most recent tangent next. This is a softcover medium format book with 64 full colour pages. To flick through the pages is a pleasure, beautiful photographs, nice tables and well laid out text. I started up a Samurai project three years ago with Impetus basing, but it quickly ground to a halt. I have since decided that any new eras are going to be skirmish, so this ruleset fits with my plans. Really minimal figures are require, less then 20, I believe. 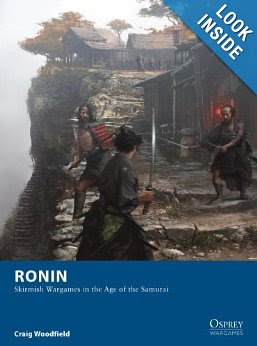 Roly Hermans on his blog has a very nice series of posts about getting into Samurai skirmish gaming with excellent articles on figure selection, terrain and buildings. Read all his posts, much recommended. A excellent review of the rules can be found Hachiman's Toy Chest. Available at Amazon. Last up is a book which has been out for sometime, I had a bit of difficulty finding it, but eventually did so. Over the last few months, I have had a couple of FIY games avec les amis in Montreal, using the This Very Ground ruleset. Really quite enjoyed the games, all the figures were provided by Iannick and Rusti. I am however intrigued by games which are card driven, I am really losing interest in IGO-UGO games, they really come down to the winner being the one who knows the rules best. I like having a strategy planned, but really I do not think the outcome of battles were affected without an element of chance, I like a bit more then just dice to be influencing this. So here we have this ruleset, from the excellent writers of SAGA. I had to have a look and unfortunately I also could not resist painting a few figures myself, but more about that in a minute. I was a little let down by the production as although it has lots of photos, it is in black and white. Otherwise though the full format soft cover book is quite well laid out and quite readable with lots of diagrammes. The cards are colour but are on quite thin paper, I might have to laminate them. I would have been happy to pay more for a full colour book with better cards, but still the rules look great. I will refer you back to Anatoli's Game Room for another excellent review. Available from On Military Matters. 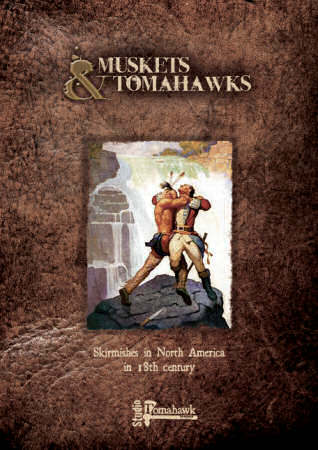 I have to admit that I also wanted to paint a few figures for FIY and I needed a guideline, which Muskets and Tomahawks offers. After some discussion with Iannick and his agreement to trial the ruleset (after all he is the one who first bought it and showed it to me), I have planned a small 200pt force. Of course, the descendant of the coureurs de bois has insisted that I do the English. The figures arrived yesterday from Conquest Miniatures and they are absolutely excellent, I am off the next week so I am sure some paint will be applied. I am keeping the composition of the force secret until I have my first game with Iannick, I believe it will just make it more fun, and the rules are well tailored to this aspect of gaming. I think you'll really enjoy M&T. I've only been able to get in a few games, but they've all been a blast. I'm still wondering about which range of figures to get for M&T! I've just bought Ronin too but am holding off on the figures as I have so many more figures due to arrive presently! You have a lot of irons in the fire...all good ones. In 2013, I too have fallen under the sway of skirmish gaming! An ornament of the hobby is Henry Hyde - I will read the reviews of his Compendeum with relish and might even order it myself! Lots of reading there! You're as bad as me for distractions. 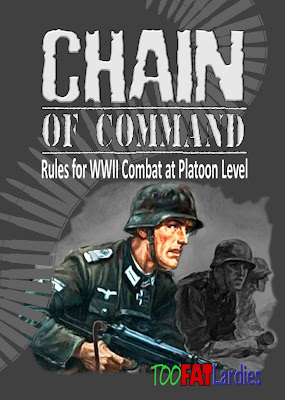 I picked up 'Chain of Command' as well and am going to try it with my new post-apoc stuff.